the Humble, Kingwood, Atascocita area. 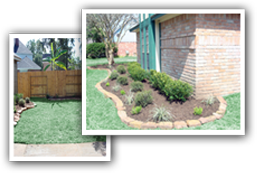 We are a family owned and operated lawn company founded in 2006, we are a quality oriented service company, we are a dependable company working in Humble, Atascocita, and Kingwood area. We are an accredited business with the BBB. Making your lawn an A + Lawn in your neighborhood. We've recently launched our new website to better service you, our most valued clients!